No more rough handling of your containers with liquid, food, chemicals, powders, etc that must remain upright or have minimum tilt in transit. Alert carriers with our Tilt Indicator Labels. 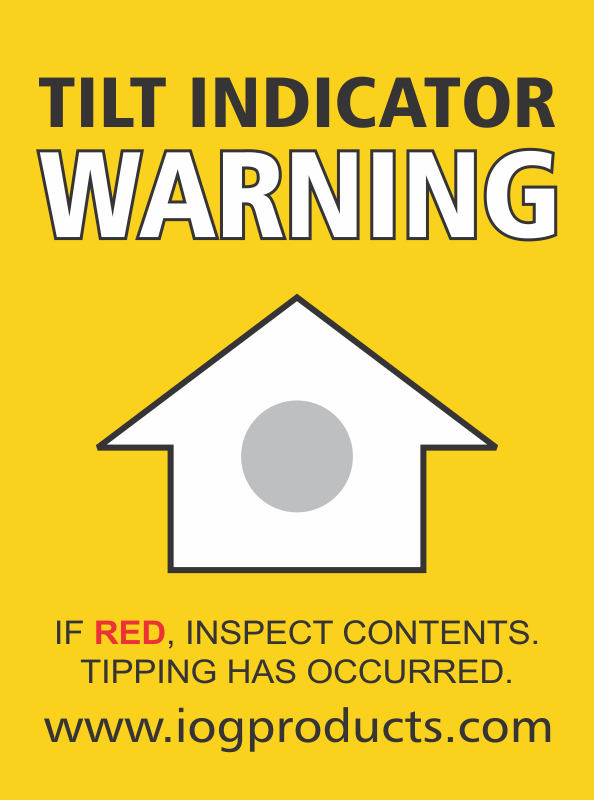 By changing the color to red, this Tilt Indicator Label can monitor whether a package was tipped or tilted for more than 65-75 degrees. • This is an affordable way of deterring poor handling on palletized shipment. • Color change determines mishandling prior to acceptance or carrier change. • Use this 3 Axis Tilt Indicator with companion alert label for maximum effectiveness. • Technology in label tracks whether or not a package has been tilted on its side or upside down during transit. • After the back lining is removed and the label is applied to a package, indicator circles will turn red if the package is overturned or tilted on its side. • Labels attach to the package with adhesive. • Larger 8.5" x 6" Companion Labels with instructions for handlers are sold separately.